Immaculate, air conditioned, ocean view three bedroom , one and one half baths. From the living room, beautiful views of Martha's Vineyard and Nantucket Sound; 300 yards to Surf Drive Beach, .5 mile to Falmouth Center. Located on the best street in Falmouth, Shore Street. One half mile to Bike Path which is a scenic ocean ride to Woods Hole. Close to many amenities of Falmouth : ferry to Martha's Vineyard and Nantucket, Harbor, theaters and Golf Courses. Living Room provides views of Martha's Vineyard and Nantucket. Washer/ Dryer. Cable TV and High Speed Internet. Look out window to Surf Drive Beach. Look out window to see beautiful Nantucket Sound. Air Conditioning throughout the home. Washer and dryer in the home. Outdoor enclosed shower in garage area. Living Room has a non-working fireplace. View Vineyard Sound from outside patio. The home was so welcoming with the bright and airy rooms. It was very clean as well. The patio was useful for entertaining family and friends. We appreciated the pretty outdoor planters with vibrant flowers! Inside was spacious with all the amenities. The house was located close to the beach and the main street which offered wonderful boutiques and outstanding restaurants. 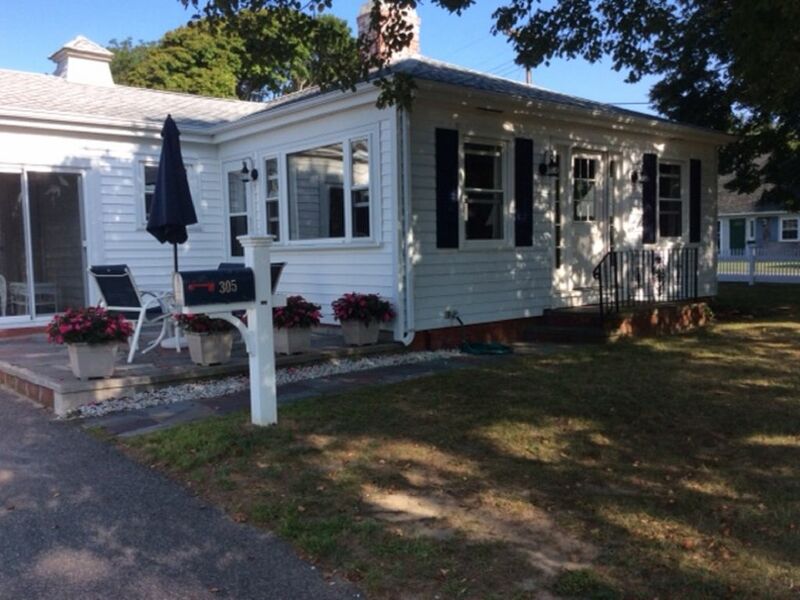 We will definitely consider returning to 305 Shore Street in Falmouth! We would definitely stay here again. It was perfect for our family. Our daughters loved the bright and airy feel of the house. Shore street is a little busy at times with traffic, but the bedrooms are set back off of the street so street noise is not a problem. The house is immaculate with exception of dog hair and smell in front room carpet. I didn't realize it is a pet friendly rental, but that's really the only trace. The owner, Mary, was available if we needed anything, but we were perfectly content and had no issues. The house was in a perfect location to walk or bike to many attractions. It was clean and well stocked. Mary and John are great and are nearby in case you need anything. My family of four just enjoyed a wonderful stay at Mary's charming home in Falmouth. The house was spacious, clean and comfortable, and (most importantly) a very short walk to the beach. The provided beach chairs and sand toys were much appreciated! Mary was friendly, easy to communicate with, and very accommodating. We would definitely stay here again! We've stayed with our family at Mary's house on Shore Street several summers in a row. It's a beautiful place to stay in its own right - spacious, inviting, clean, and very homelike. There is a lot of natural light from the many windows and there are wood walls and floors in most of the rooms. We like to cook, and the large kitchen is well stocked in terms of pots, pans, bowls, and other cooking utensils. The house is also surprisingly quiet; people in a bedroom with a closed door don't necessarily hear others if they're walking around. In addition to the warmth of the house itself, the location is perfect. It's a short walk to the beach and a slightly longer but easy walk to town. You can see the sound and Martha's Vineyard from the large front window, and you're also just a few minutes' bike ride to the bike path. Finally, Mary, the owner, is very kind and helpful and has always made our teenaged children feel welcome. If you are looking for a simple, lovely rental with real Cape atmosphere, look no further; this house is just right. My family and I just spent a weeks vacation at this charming home. We were in Falmouth for a family wedding and then a vacation. This is a great house in an awesome location. It is clean, spacious and very comfortable.All the amenities are there and it is perfect for entertaining family and friends. There is plenty of room for indoor and outdoor dining. The view from the home is Nantucket Sound and sunsets are beautiful. It is a short walk to town and the beach is right there as well. Falmouth and the surrounding area offer everything including good dining, shopping and entertainment. Mary, the owner of this charming home is so helpful as well. Three bedroom, 1.5 baths, waterview air conditioned home with views of of Martha's Vineyard and Nantucket. 3 miles to Woods Hole where one would take the Ferry to Martha's Vineyard or Nantucket, close to scenic Bike Path along the ocean drive, one mile from Highfield Summer Theatre and a mile to lovely downtown Falmouth. Walk to harbor. Enjoy a Cape Cod League Baseball Game one mile away.Washer,dryer. SPECIAL: JULY 7-14th $2500.00 Winter Rental September 12, 2015 -May 31, 2016 $1200.00 plus utilities April 19, 2014-June 28, 2014 2,000.00 weekly 1/2 Rent due reserve week, remaining rental amount plus $300.00 Security deposit due 30 days prior to rental week. Security deposit will be returned within 7 days after departure provided home is left in proper condition.